I honestly feel this is the saddest musical composition ever written. After listening for many year's I'm still not calloused to its beauty and power. The piece consists of three movements written over three months in 1976. A solo soprano sings three different stories. A Polish lament of Mother Mary, a message written on the wall of a Gestapo cell during World War II, and a folk song of a mother searching for her son killed in the Silesian uprisings. The dominant themes of the symphony are mother and son and the separation war causes. Polish culture is steeped in pain and suffering and when you listen to this piece you will feel all of it. Completely let yourself go while listening and you WILL be deeply moved. This piece also marks a departure from Gorecki's dissonant characteristics toward a distinctly tonal direction. I find it interesting to recognize the influence he has had on Drone and Ambient artists with work created almost entirely from minimal tones. Much like Morton Feldman, Gorecki needs large amounts of space to focus your attention on the balance of sound and the lack of sound, both of which are integral aspects of the work. 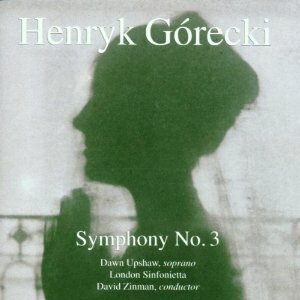 My favorite version is by Conductor David Zinman with the London Sinfionetta, Dawn Upshaw solo Soprano.